Just when you think you’ve got this amateur astronomy thing down, the astronomy gods serve you a heaping helping of hubris. Can I tell you about my Saturday night? Conditions didn’t look like they were going to be perfect, no. There were scattered clouds scudding across the sky, the wind was rising, and the thermometer was falling. Not a night for deep CCD imaging, that was for sure. However, following my age-old prescript, “Head for the Dark Site Unless It’s Raining,” I said the heck with it, packed up my Nexstar 11GPS, and lit-out for my club site, which is quite a few miles west of Chaos Manor South in the small town of Tanner-Williams, Alabama, close to the Mississippi-Alabama state line. Frankly, I was excited. While my dark observing site isn't perfect—there's a prominent light-dome to the east—the Milky Way is visible and can even be striking on a halfway decent night. And if I couldn’t do any CCD imaging, well, I’d do some visual work and maybe give my Stellacam II deep sky video camera a workout. God knows, I haven’t used it nearly as much as I should have over the two years I’ve had it. Couple the Stellacam II to a C11 at a decent dark, and you’ll be amazed at just how deep you can go. Wind is not a deal-breaker as it would be for “real” CCD imaging, since the camera's maximum exposure time is a forgiving 12 seconds. After a halfway pleasant drive (once I got out of the city…this Mardi Gras traffic is murder), I turned off onto the dirt road that leads to the disused airstrip where we do our serious observing and—whoops!—almost got stuck. Rain and work on the scruffy old road made me thankful I’d brought a 4WD vehicle rather than the Camry. Getting stuck out in the sticks ain’t no fun. Excitement over, I got the RAV4 unloaded, set up the telescope, laid out the rest of my astro-stuff, and was just about ready to sit down on the observing chair and wait for darkness. “Might as well go ahead and plug in the telescope hand-controller,” I thought. Then it hit me. I didn’t even have to hunt through the gear to know. The box containing the NexStar HC was sitting back in Chaos Manor South’s living room. If you’re a go-to owner, you know that without that all important hand controller you are sunk. Like many go-to rigs, the NS11 doesn’t sport manual slow motion controls. Oh, if I’d brought my laptop I coulda saved the day via the “virtual HC” program, NexRemote, but since I wasn’t gonna be doing any CCDing, I had not packed the laptop. What was there left to do? Nothing except sit and sulk for a few minutes, pack up the Toyota, and head for home. Only thing to salve my wounds? Once I'd got everything back in the car, the clouds were rolling in, and by the time I was halfway home we were totally socked in. What’s the solution? Don’t get too cocky. We’ve all laughed at the stories of the goobers who’ve wound up at distant star parties only to find they’ve forgot their eyepiece box or GEM counterweight. Yeah, laugh. It will happen to you. 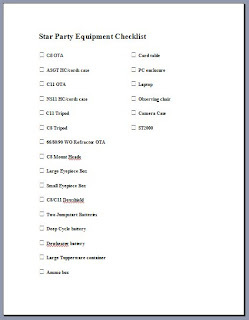 After this “fun” evening I’ve resolved to always do what I usually do when packing for big star parties: make up a checklist and don’t even think of leaving home without triple checking that everything on this list is in the car. “But Unk Rod,” you say, “all I’ve got is an 8-inch Sonotube dob and a box of Chinese Plossls.” I don’t care. I guarantee you will eventually be left standing out in the middle of an observing field with egg on your face just like your Silly Old Uncle. You'll forget your eyepieces. Or the rocker box. Or your star atlas. Or your red flashlight. “Checklist discipline,” as we used to say in the ICBM launch business. Checklist discipline, my friends.